MSI Technologies focuses on Intacct Cloud accounting software implementations in New Jersey, New York, Pennsylvania and nearby states. For today’s midsized businesses, a cloud-based ERP software offers amazing advantages and cost savings. Intacct is the industry leader in cloud financial management and accounting software. MSI Technologies offers your company with a flexible, comprehensive and customized ERP solution on Intacct platform to help you meet your business, reporting and financial needs. Intacct offers a cloud based comprehensive, fully integrated financial management and accounting system designed to fit your evolving business. Get instant visibility into your performance to help manage your organization's growth. With Flex Reporting, you don't have to settle for a one-size-fits-all approach or resort to alternatives that can't keep pace with your business needs. It delivers visibility into the standard financial metrics that you need and the unique business metrics that measure the success of your strategies and operations at every stage of your growth. The most important people in your business aren't in your business. They're your customers. And using online accounting software from Intacct to manage every aspect of their experience with your company—from order-to-cash through post-sales service and support—is an irreplaceable ingredient to your success. Look at your performance any way you need. Flex Reporting lets you carve out the information you want using Intacct's innovative flex-dimensional general ledger and easy-to-use, guided report writer. With these financial reporting and business reporting capabilities, you can automatically track the business context of all your financial transaction data with the accuracy and completeness you need from a financial system of record. Winning companies take advantage of Intacct online accounting software to engage all their employees in financial processes—not just the finance team—because they recognize that finance touches virtually every area of the company. Get higher quality information without extra costs, reporting tools, and IT effort. Unlike alternative approaches, Flex Reporting delivers higher quality information because you can enforce tight controls to ensure your data is complete and accurate as it's captured in the system. So much of your customer-facing efficiency relies on properly managing the vast range of suppliers, contractors, vendors, and other partners with a stake in your success. How can online accounting software from Intacct help you keep your suppliers in line, optimize your inventory, manage your working capital, achieve perfect orders and keep your supply and demand chains humming, and in peak condition? No two businesses are alike. For too long, controllers, CFOs, and financial professionals have endured compromises, fragmented processes, and cumbersome workarounds. Or they've suffered through seemingly endless and expensive customizations that never seem to get it right. Eventually, what doesn't fit into the financial system goes into Excel, which adds costs and compliance headaches. 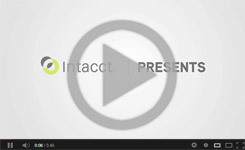 See how Intacct online accounting software makes it easy to connect your critical systems. Receive a Free Quote for Intacct today!